Get pumped up Husker Nation — We’re playing Alabama Tonight! The last time the Crimson Tide came to Lincoln, it was a crisp September day, the second game of the season, Nebraska was 0-1 and unranked in the polls — and it was a year in which a Star Wars movie premiered in theaters. Rick Berns racked up 128 yards on 23 carries the last time Alabama rolled into Lincoln. Low and behold, what’s in store for this year’s match up with Bama? Crisp September day — check! Second game of the season — check! Nebraska is 0-1 and unranked in the polls — check! And Star Wars, Episode Abrams hits theaters this December — check! What happened when the same ingredients were thrown into the mix back in 1977? 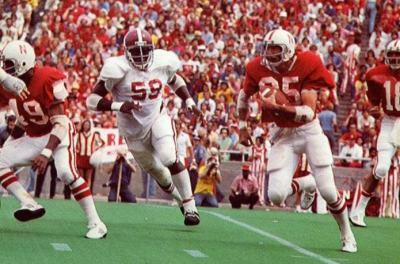 The hapless Huskers took down the mighty Alabama Crimson Tide 31-24 in what was then described as the “most colorful and emotional effort of the Tom Osborne era.” It would be the only time Bear Bryant would be beaten that season. So, fasten your seat belts and get ready for a little case of history repeating itself. Bama is going DOWN! Okay, okay… Enough shenanigans. The boys from Tuscaloosa aren’t heading to Lincoln this year or any year currently scheduled. Instead we’re getting a group of guys from Mobile, most of whom would never make the three deep on their in-state blue-blood to the North’s loaded roster. But is that any reason not to get fired up all the same? After the heart-attack inducing final second of the BYU game, maybe the tailgaters in downtown Lincoln could use a bit of a relaxer. A situation in which something resembling a football game takes place, but the outcome of the contest is never in doubt. Enter, the (South) Alabama Jaguars. Vegas puts Nebraska as a 27-point favorite. I’m thinking, take the Huskers and the points. Riley and company will look to make a statement Saturday night— the rust is gone. The inconsistencies that allowed BYU to own the second quarter (while Nebraska owned pretty much everything else) have been worked out of the system. And you will see a precision machine ready to combine the remainder of the unharvested schedule. Several years ago when the Huskers were still in the Big 12, I was watching Nebraska vs. Colorado at the In-Laws’ house. My wife’s stepbrother, Mike, was there. A rabid Husker fan who, for the fun of it, resides in Boulder just on the principal of keeping your enemies closer. The Huskers kicked a field goal to pad their lead, but Mike was still fuming. He wouldn’t let go of the idea that Nebraska blew a chance to tack on another touchdown. My wife looked at me, rolling her eyes. I knew what she was thinking — Nebraska’s got the game won. What’s the big deal? Well, the big deal was something that Mike and I both knew. Nebraska wasn’t merely playing Colorado (who, by this time had been driven by Dan Hawkins to the conference cellar). Nebraska was competing against the hypothetical performances of other upper-tier football teams were they to also play the Buffs. So beating Colorado by three touchdowns isn’t sufficient if you can imagine Ohio State, Alabama, or Oregon beating them by five or six. This was a concept well established by the time I started following the Huskers in the 1980s. Hammering Utah State 63-13 the second game into the 1988 season wasn’t a mere act of inhospitality. It was a necessity. Because you just knew that if Oklahoma or Florida State were wailing on the Aggies that day, they’d be doing it by at least as much. Utah State was not so much an opponent, but a gauge. A way to judge whether or not the Huskers looked capable of toppling a big dog. Bill Bryson, the well known travel-writer/humorist once described attending a Husker game as Nebraska leading their outmatched opponent by six touchdowns, while the obnoxious throng in the stands brayed for more. Bryson obviously doesn’t get it. He comes from a world in which 17-point wins over the likes of Illinois State are no cause for concern. That world is called Iowa. But, for fans west of the Missouri River, we know better. When (South) Alabama falls five or six touchdowns behind the Huskers on Saturday, that’s when the collective nerves at Memorial Stadium will first be soothed. Because Alabama will actually be down on the turf, too. Facing off against the Jaguars, superimposed over the Scarlet and Cream.